My dad's girlfriend "volunteered" to pose together with the fantastic Aldi waffle cone, but it did not look this perfect for long. A couple of small but fast fingers rushed in front of the camera and grabbed the Aldi oreo cookie. My kids and I have not had Neapolitan ice cream since our last European vacation, but when when I saw that Aldi had the Neapolitan ice cream at $1.99, I just had to give it a try. I thought it would be perfect for ice cream cones, since my dad was coming to visit and I was beginning to reminisce about my Danish childhood. I was curious to whether or not I would be disappointed when tasting the Aldi Neapolitan ice cream for the first time, because I realized beforehand that I had a very idyllic image and perception of the Neapolitan ice cream that I grew up with back in Denmark. I love most (but not all) of Aldi's products, and I was afraid that I was setting the standard too high for the ice cream. I took one bite of the Neapolitan ice cream from Aldi, and I was amazed. I had to take another bite just to make sure, and then I made my declaration. "It taste just like the Danish ice cream!".... (of course this was said in Danish). My dad agreed, and so did his girlfriend...... As for the kids, they did not say much, but instead they gobbled up every single bite of ice cream and waffle cone. The Neapolitan ice cream, tasted just like real ice cream should taste: creamy, fresh and delicious. The Aldi Waffle Cones are also known as Benton's Kids Jumbo Waffle Cones, and they are the perfect size for a couple of ice cream scoops. They do not start sagging, they keep their crunchiness, and contrary to many waffle cones, they held in the ice cream. I did not detect any ice cream leaks, and they are perfect for both small and big hands. When I was about 10, my family went on vacation to England for the first time, and I still remember my first encounter with "cardboard" cones. We were on top of a mountain somewhere in England, and there it was - an ice cream truck with bells, whistles and all the sha bang. My parents had no choice than to buy all of us ice cream, and at we were very excited about the special looking cones (also known as wafer cones or "kiddie cones"). We were only used to waffle cones in Denmark, and we sure were disappointed when the cones tasted like cardboard. Since then I came to value a good waffle cone, and I will say that Aldi's Jumbo Waffle cones have passed the test. The price of the fabulous ice cream cones is phenomenal, and so is the Aldi ice cream price...even without coupons. Now, I could of course go into details about the nutritional value (or the lack thereof), but I am going to skip this part today, because when you are in for a real ice cream treat you should enjoy every single bite of it. If you decide you want to take a closer look at the nutrition facts, just right click on the image below. 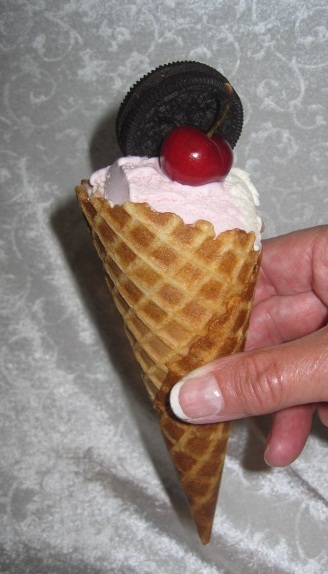 Have you tried any of the waffle cones at Aldi? What is your favorite Aldi ice cream? Thanks for the heads-up! I haven't had cones in the longest time because like you, I'm a stickler for the waffle variety. The best sundae cones I've ever eaten - complete with ice cream, chocolate, nuts, and a generous deposit of rich chocolate in the cone's point - are at Aldi. They beat ALL the competition... give 'em a try!